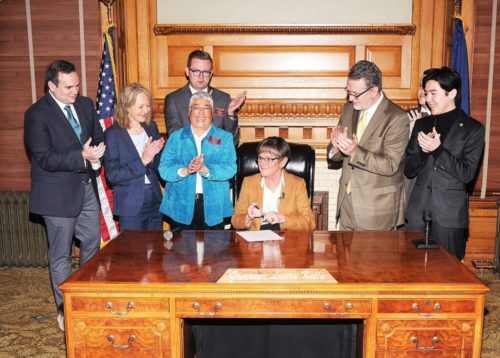 Kansas Governor Laura Kelly has signed an Executive Order restoring protections to LGBTQ state employees as her first official act in office. Kelly was sworn in Monday, ending an eight-year reign by Republicans San Brownback and Jeff Colyer. She will be facing a GOP-dominated state House and Senate. Brownback, a strict conservative, issued an executive order in 2015, rescinding protections for LGBTQ state workers that were put in place by former Governor Kathleen Sibelius in 2007. Those protections that are now back, thanks to Kelly. The new Executive Order also expands the policy, including government contractors under the protections. The new order will only affect those departments under the Governor’s direct control, affecting some 19,000 state workers. With the extension to government contractors, however, this could affect many more. Meanwhile, Representatives Susan Ruiz (D-Shawnee) and Brandon Woodard (D-Lenexa) are planning to introduce a bill to add sexual orientation and gender identity to the state’s non-discrimination laws. Both Ruiz and Woodard are out members of the LGBTQ community. Kelley has stated that she would sign such a bill.